In most images and carvings of Isis breast feeding, it is claimed she is breast feeding an infant or a child; however, in this stone relief at Philae Temple, (Philae Island, Aswan Egypt), she is clearly breast feeding an adult Pharaoh. The difference in height reflects the difference in divine status. The Pharaoh is mortal, Isis is a Goddess. We can identify the female figure as Isis because of her headdress. The Vulture Crown, (worn on top of the head), was worn only by royalty and priestesses. 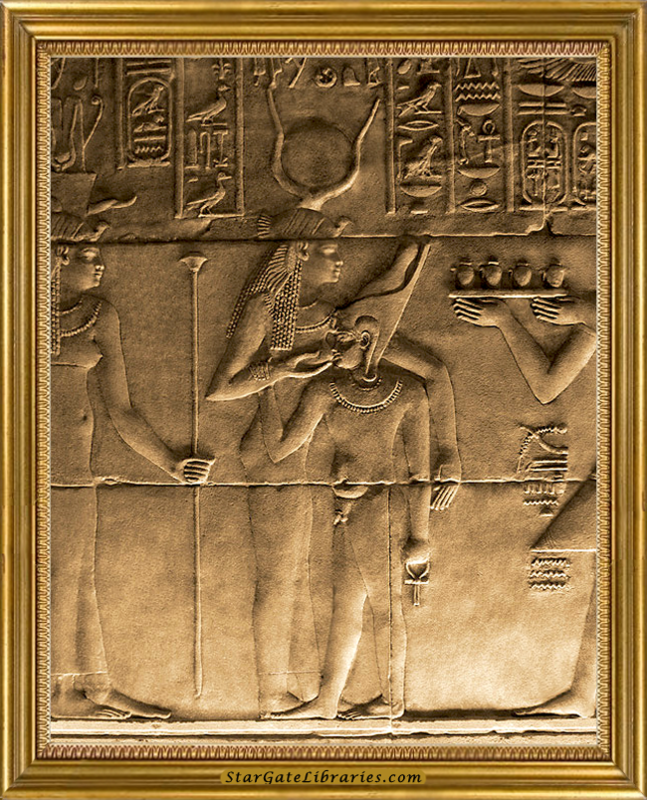 On top of the Vulture Crown sits the cow horns and sun disk of Hathor, the physical incarnation of the Goddess Isis. The Pharaoh being breast fed is wearing a Double Crown, (or Pshent), signifying he ruled both the upper and lower Nile valleys. In his left hand he is carrying an Ankh, the symbol of life. The Goddess on the left is also wearing the Vulture Crown of a priestess, but garnished with a feathered plum with the cow horns and sun disk of Hathor, a headdress associated with Queen Nefertiti, wife of Akhenaten, (Amenhotep IV). If this is the case, the Pharaoh being breast fed could be Akhenaten. It also should be noted: This is a digital recreation of the original Isis relief at Philae Temple. The original has been severely damaged by vandals, with the face of Isis completely obliterated. So much is lost through ignorance.